1) Unlike other ICOs that do not have a product launched and bear product development risks, LiveEdu is an existing developed product with a monetization model and seasoned team. The team has extensive sector domain expertise in the education and video streaming space. Moreover, the team has worked for two years building LiveEdu. The shift from non-structured casual streaming (non-premium projects) to focus on monetizable projects (premium projects) represents the only change to LiveEdu’s business model. They have all the ingredients in place to scale the LiveEdu network and business right after the ICO. 2) A scrappy, young, agile, small team that moves fast. They are very technically-strong and built our entire live streaming and video infrastructure from scratch with 50 edge servers worldwide. 3) They have extensive data on cost-effective user acquisition channels having acquired 1 million viewers and 13,000 content creators with no paid marketing. They don’t need to search for new streamers as existing users will be retained with an attractive economic model. 4) Unlike other ICOs, LiveEdu is a marketplace that organically generates token demand (monthly subscription purchases). This means token price is not driven only by financial speculators on exchanges but by actual product usage and company growth. 5) LiveEdu has huge growth potential by growing horizontally (launching projects in Chinese, Russian, Portuguese, etc) and vertically (by expanding the number of topics). 6) LiveEdu is committed to focus only on future technologies that no online education or professional development company is focused on. Their goal is to build the biggest project learning library for technologies of the future: artificial intelligence, cybersecurity, game development, data science, cryptocurrencies, programming, design, and augmented and virtual reality. 7) ICO contributors will have voting rights for key decisions in the ecosystem; for example, advising on which projects to build first and which new topics or product features to add. 8) Be part of a project that is building the YouTube for online education and professional development using the blockchain. 9) Your contribution will bring cryptocurrency to the masses by educating college students and professionals using real practical cryptocurrency projects covering cryptocurrency basics, blockchain mining, Bitcoin, Ethereum, security and ICO. 10) The global professional development market is $306.9 billion USD in size. LiveEdu is the first ICO in the professional development space with the vision to put global professional development on the blockchain. 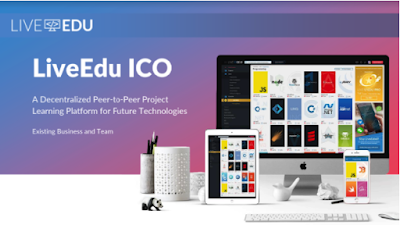 LiveEdu is a decentralized peer-to-peer project learning platform for people to improve their job skills in future technologies. LiveEdu is building the YouTube for online education and professional development. We are taking one category out of YouTube and building it out into a bigger category of its own. Just as Twitch took the category gaming out of YouTube and built it into its own large vertical, LiveEdu is taking the category professional development out of YouTube.